Performance Mesh Fabric. 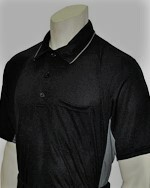 Available in the Following Colors: Black with Grey Side Panel. Sized to Accomodate Chest Protector. All Styles and Colors Available in Sizes: Small - 4XL.